These sterling initial disks are about 3/4" in diameter. There is an initial stamped on one side and a date stamped on the other. In order to do this, 2 disks are made, hammered, and sweat soldered together. I drilled a hole and soldered on a sterling rope ring which is the bezel. 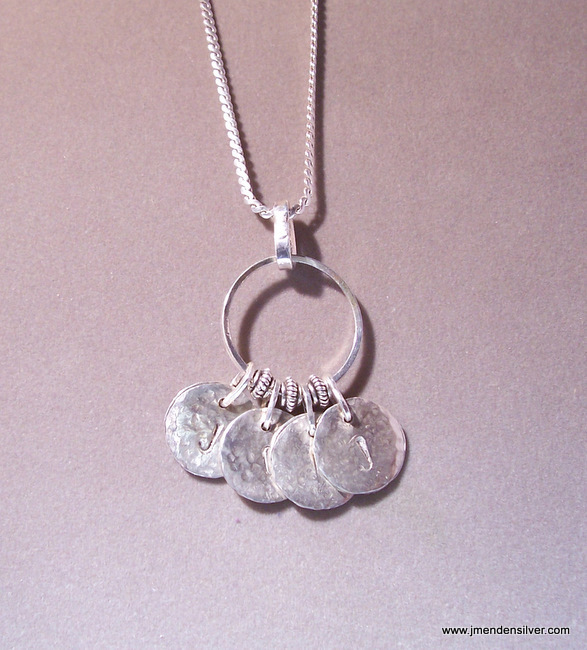 These disks were strung on a large sterling circle along with generous sized sterling beads as separation. A thick chain is appropriate due to the weight of this finished necklace. Names can be used rather than initials if desired. Each "charm" is $40, or $50 with a small chain. Contact me for info on possible ways to use these charms and prices.